No one would have believed in the last years of the nineteenth century that this world was being watched keenly and closely by intelligences greater than man's... Yet across the gulf of space, minds that are to our minds as ours are to those of the beasts that perish, intellects vast and cool and unsympathetic, regarded this earth with envious eyes, and slowly and surely drew their plans against us. So begins The War of the Worlds by H. G. Wells, the first alien invasion story, and perhaps the best known, in which late-Victorian England, then homeland of the world's greatest empire, is conquered with casual ease by Martians. In the end, only chance saves humanity from slavery or annihilation. The story begins with the unnamed narrator, a lightly disguised version of Wells, visiting an observatory, where he is shown explosions of the surface of Mars. Shortly afterwards, an apparent meteor lands close to the narrator's house in Surrey. When he goes to look, he sees the first of the Martians emerging from its spacecraft. The invaders swiftly set up strange machinery, incinerating all humans who approach. The narrator takes his wife to presumed safety then returns just in time to witness gigantic tripods, Martian war machines armed with Heat Rays and poisonous Black Smoke, smashing their way through the massed ranks of the British Army. Three tripods are brought down in a succession of battles before the army and navy are routed, with more Martians landing, reinforcing the invaders. A few are making grandiose plans for resistance, but it is clear they have no prospect of success. Great Britain has been utterly defeated. The narrator becomes trapped in the ruins near another Martian landing-site, where he gets a first-hand view of the aliens drinking human blood. It seems they intend to treat humanity as nothing more than food. At this point, when the full consequences of defeat have become apparent, the Martians disappear. Returning to London, the narrator finds that all the Martians have conveniently dropped dead, killed by some terrestrial microbe. There have been several movie versions of this story (the two most famous being released in 1953 and 2005), as well as the notorious Radio Drama, a TV series, renovelizations set in "the present day", a mostly-overlooked but surprisingly faithful RTS game, and, of all things, a Rock Opera. It has also influenced many subsequent alien invasion stories. Interestingly, the novel was originally considered part of a different genre - the "Invasion Story", of which there was a spate in the late 19th and early 20th centuries, depicting fictional invasions or invasion plans of the author's home country, usually by German or Crypto-German forces. Only later did the "alien" part of "alien invasion" come to be considered more defining than the "invasion" part. For the infamous Orson Welles radio broadcast of 1938, see The War of the Worlds. For the original 1953 film based on it, see The War of the Worlds. For the television series based on the 1953 film, see War of the Worlds. For Jeff Wayne's Rock Opera, see Jeff Wayne's Musical Version of The War of the Worlds. For the real-time strategy game, see Jeff Wayne's War of the Worlds. For the 2005 Spielberg film, see The War of the Worlds. For the 2002 Dark Horse Comics version (and follow-ons) see Scarlet Traces. Accentuate the Negative: This is perhaps Older Than Radio, at the very least. Wells may have written the alien invasion hitting Britain first as an example of Creator Provincialism, or else for the same pragmatic reason the current film adaptation has them hitting the USA first. (If you want to conquer Earth, take out its greatest military power first. In the late 1800's that was Britain, today it's the USA.) However, a more personal reason to Wells has been advanced. He may have had the all-destroying alien tripods land in London, at least partly with the intention of having them reduce his home region, the towns of Woking and Bromley, to smouldering corpse-heavy rubble. Wells utterly despised this part of Surrey for its parochial mentality and its lower-middle-class smug small-mindedness. He also wanted to get even for long, soul-destroying thirteen-hour days spent in a miserable McJob working for a tiny-minded bully. Today's Woking boasts a statue of an alien tripod on the main street to commemorate Wells' vision. Agent Scully: An early example in Ogilvy. Alien Invasion: One of the very first such stories to be told. Big Creepy-Crawlies: Wells notes when introducing the Martians proper that all present expected "a man." What emerged was decidedly more Lovecraftian. Even granted the genre was an outgrowth of terrestrial varieties, future Alien Invasion stories seem to have largely missed this delightful precedent. Brilliant but Lazy: The Artilleryman, who lays out a convincing prediction about the new order the Martians will bring and how humanity can eventually retake the world, but treats the whole thing as an idle hobby. "Oh, one can't always work," he said, and in a flash I saw the man plain. Averted in one incident involving Chekov's gunfire. At one point, the narrator hears the sound of heavy gunfire that sounds like artillery pieces. Never expanded upon. Comic Book Adaptation: Or comic book sequel, rather. The Marvel character Killraven lives in the post-apocalyptic world left after the Martians made a second attack in the late twentieth century. War Of the Worlds also forms the backbone of the second volume of The League of Extraordinary Gentlemen. Scarlet Traces by Ian Edgington and Disraeli, is also a sequel - Britain is now reaping the benefits of the Martian technology; the same team later reunited to do an adaptation. Cool Boat: HMS Thunder Child. At the time, a torpedo ram like Thunder Child represented the most powerful destructive force in the world - fully ironclad, with a sharp ram on the bow, torpedo tubes, heavy guns and powerful engines to take it up to ramming speed. In the real world, however, torpedo rams were completely useless; all that they ever destroyed was a single, grounded ship and a harbor jetty. The Other Wiki says "It has been suggested by some that, in view of the limited military value the torpedo ram demonstrated, Wells's immortalization of the type in what would become a literary classic was the torpedo ram's greatest achievement." Considering that this pinnacle of technology manages to blow up two Martian tripods, one of them by the shrapnel resulting from its own explosion, it's not much of an achievement. The Martians had fewer than thirty tripods in the book. This fight represented all but one of their total combat losses. And given that Humanity was basically completely overwhelmed by this point, for the Thunder Child those two Tripods were quite an achievement. Cool Plane: The original novel briefly mentions a Martian flying machine (see the quote below). This was a cool plane by virtue of it predating the existence of any actual Real Life planes, and yet uncannily matching the appearance of a flying wing bomber like the B-2. Something rushed up into the sky out of the greyness - rushed slantingly upward and very swiftly into the luminous clearness above the clouds in the western sky; something flat and broad, and very large, that swept round in a vast curve, grew smaller, sank slowly, and vanished again into the grey mystery of the night. And as it flew it rained down darkness upon the land. Creator Provincialism: There is no mention of what happened outside south-east England; it's not even certain if the invasion reaches beyond England. It's actually pretty clear that it doesn't: at the end the narrator notes the relief pouring in from "across the English Channel, across the Irish Sea, and across the Atlantic," implying that Europe, America, and even Ireland were left untouched. Curb Stomp Battle: The entire war. While the humans manage to down several tripods, it's pretty one-sided, especially after the Black Smoke comes into play. Dead Line News: The radio drama, combined with Kill'Em All. Even the narrator goes down. Deadly Gas: The "black smoke" used in the novel. Death Ray: The Martian "Heat Ray". Deus Ex Machina: In the end, when all the weapons of Earth's mightiest superpower have failed to make any significant impact on the Martian attack, they die of exposure to Earth bacteria. Although, to give H.G. Wells credit, he did make mention of them in the opening monologue. Unknowingly Heroic Microbes were in the story from page one. For that matter he also makes clear midway through the book that the Martians have long since eradicated all bacteria and viruses on their own planet and live completely free of disease, as well as their feeding method which consists of injecting human blood directly into their own veins; the perfect vector for infection. It's actually all right there for anybody who is scientifically astute enough to see it coming. Disaster Scavengers: The protagonist in the novel, and most of the people he meets, after the Martians topple human civilization. Drop Pod: To deliver the mechs (or the materials needed to build them) to Earth. Dying Moment of Awesome: HMS Thunder Child takes out two Tripods before sinking whilst trying to ram a third. Earth Is a Battlefield: Especially adaptations that make it clear the aliens are attacking everywhere. Everybody's Dead, Dave: In the radio drama, large numbers of people are killed, either by heat rays or poison gas spewed from the alien spaceships. Several "field reporters" make note of this fact before they, too, succumb to the imminent danger. After a cutaway where a reporter describes millions of fleeing New Yorkers dying en masse -- falling victim to gas clouds or falling into the Hudson River to commit suicide -- a ham radio operator desperately calls out, "2X2L calling CQ. Isn't there anyone on the air? Isn't there anyone on the air?! Isn't there ... anyone???!!!" Foreshadowing: The red weed dies off not long before the Martians do. Forgotten Fallen Friend: Despite apparently being a good friend to the narrator, Ogilvy is almost never mentioned again after his early death. Forgotten Trope: War of the Worlds was actually a Science Fiction twist on the then-vibrant genre of the "Invasion Story". Frickin' Laser Beams: The "Heat Ray" is a much more realistic description of the effect of a laser than most fiction has managed since lasers were actually invented. The "Heat Ray" as being invisible, making it terrifying as the protagonists can't see the beam, only what it's currently igniting. A high-powered (and by that, we mean nuclear) infrared-spectrum laser weapon would behave pretty much exactly as described. Whilst the effects were quite accurate, the production mechanism of the heat ray wasn't anything like a laser though. Ghost City: London in the novel, and New York City in the radio play. Hope Spot: HMS Thunder Child takes down two Tripods. Slowly burning, it charges a third Tripod as the explosive stores explode, clearing a path for the escaping refugee ships. As they reach open water, aerial Martian constructs/more cylinders arriving from Mars (depending on the version) can be seen in the sky. Human Resources: The Martians drink human blood. In addition, in the novel, humans discover they've been using a third, unnamed humanoid race as we might use livestock. Humans Are Morons: Subverted. The main character observes that for all the greater technological advancements the aliens have over humans, they do not appear to have invented a tool as simple and practical as the wheel. Humongous Mecha: The towering Martian tripods are one of the first appearances of this in fiction, if not the first modern appearance. I Come in Peace: Subverted. The humans attempt this when they first meet the Martians. The peace party in question is slaughtered, and things get worse after that. The Martians don't even try to hide their intentions. La Résistance: The Artilleryman's plan involves establishing one. Les Collaborateurs: The Artillery soldier believe that the Martians probably had recruited human prisoners as recons or auxiliary troops. Canon in a comic version of the novel. Million-to-One Chance: An early example, possibly the Trope Namer, provided by Ogilvy the astronomer. Mr. Exposition: Ogilvy in the first chapter, before his demotion to Sacrificial Lamb. If it hadn't been for him the narrator would not have known about the business on Mars as early as he did. Mythology Gag: During the sequence where the narrator is watching the Martians from the ruins, he comments that they remind him of an essay he once read about how humans might evolve in a technology-dominated future, by some chap whose name he can't quite remember. The essay actually existed, and was used by Wells as the basis for the Martians' biology; its author was Wells himself. Wells also slams an artist whose depiction of the Martians he didn't like: "I recall particularly the illustration of one of the first pamphlets to give a consecutive account of the war. The artist had evidently made a hasty study of one of the fighting-machines, and it was there that his knowledge ended." 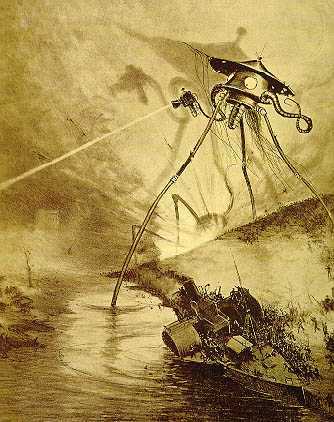 In a novel that Wells wrote forty years later, Star-Begotten, there's a hypothetical discussion about the existence of Martians and a man mentions he read a book written by "Jules Verne, Conan Doyle, one of those fellows": The War of the Worlds. Next Sunday A.D.: Published in 1898, the novel was set "early in the twentieth century." Ninja Pirate Zombie Robot: These aren't just Martians, they're Humongous Mecha cyborg vampire Martians. Nominal Importance: Inverted; the named characters, such as Ogilvy, Henderson, and the Elphinstones are minor players, while the majority of the significant characters, such as the Artilleryman and the Curate, remain nameless. No Name Given: The narrator. All we really learn about him is that he's a reporter, and where he lives. Not So Different: The Martians and the Humans. The main character compares the Martians and humans with each other many times; specially the Martians' invasion with the imperialist moments during that time. Not So Invincible After All: After shrugging off (nearly) everything humans can throw at them, the aliens die of some minor Earth disease their immune systems weren't familiar with. Human weaponry also managed to do some damage in the original. Not enough to be really meaningful in any extended conflict, but the Martian machines were never completely invulnerable. Imagine the same invasion in the year 2011, with the same tripods, same heat rays and same bloodthirsty martians. They'd be up against missiles, tanks and possibly nuclear weapons. Definitely not so invincible after all. This is why all subsequent adaptations usually give the war machines indestructible forcefields. Our Vampires Are Different: The Martians need human blood, therefore they could be technically considered some kind of vampires. Plant Aliens: The red weed grown (or at least imported) by the Martians. Public Domain Character: Or perhaps, Public Domain Civilization, since (more or less) nobody ever reuses the human characters, only the Martians. The most obvious example is in The League of Extraordinary Gentlemen comics, though the book wasn't even in the public domain when the first knock-off appeared. Recycled in Space: When the novel was written, invasion literature (a now-forgotten genre of stories about foreign countries invading England), was popular. War of the Worlds is basically one of these stories WITH ALIENS! Red Shirt Reporter: Henderson, who was too interested in the Martians for his own good. Averted with the narrator, who is another journalist. And before we judge them too harshly, we must remember what ruthless and utter destruction our own species has wrought, not only upon animals, such as the vanished bison and the dodo, but upon its inferior races. The Tasmanians, in spite of their human likeness, were entirely swept out of existence in a war of extermination waged by European immigrants, in the space of fifty years. Are we such apostles of mercy as to complain if the Martians warred in the same spirit? Sacrificial Lamb: Arguably Ogilvy. He is friendly to the narrator, seems to be well-intentioned enough if naive, and plays an important role in the story right up to Chapter Five, in which he becomes Heat Ray fodder. Scavenger World: The protagonist spends much of the novel evading detection by the Martians and trying to scrounge up enough food to survive. Just the threat of Martians advancing on London is enough to turn that well-heeled city, the pinnacle of British civilization, into a madhouse of disorganized panic. Spiritual Successor: The War of the Worlds is arguably this to The Crystal Egg, a short story written by Wells the same year, featuring an optical gateway to Mars. Martians and their machines are described, although the events in The War of the Worlds are not clearly foreshadowed. The Tripods, a series of young-adult novels by John Christopher, is in all but name a sequel set in an Alternate Continuity where the Martians were successful in dominating the world. Except Christopher's aliens are three-legged chlorine-breathers from a (different star's) world with higher gravity than Earth, and they took over via Mind Control ("The Trippy Show") rather than war. There was, of course, an actual (and, dubiously, claimed to be "authorized") sequel. It was almost entirely unrelated to the original book (setting the original invasion in Boston, America, among other things) and involved the cannibalization of Martian technology by Earthly masterminds, including the man who both supported the publication of and lent his title to the book. This was called (and was, indeed, about) Edison's Conquest of Mars. Starfish Aliens: The Martians are utterly inhuman. Even their technology is alien; they never invented the wheel, and their mechanical systems use mind-bogglingly complicated systems of levers to do the job of a cogwheel. If the Martians never invented the wheel, then how did they invent the screw-top hatches on their craft? Screw-top hatches aren't wheels. They don't have axles or bearings, and after a few rotations they either lock up or fall off. They are, in fact, spiral inclined planes. One can also think of the mathematically advanced Mayan civilization who invented the wheel and used it...as a toy. Stripped to the Bone: The fate of the Heat Ray victims in several film or graphic novel adaptations (notably the Pendragon and Graphic Classics ones). Stupid Scientist: Ogilvy the astronomer, somewhat, although he does change his mind when presented with evidence. The Theme Park Version: In the novel, humans manage a few isolated successes against individual Martian tripods, and there are mentions of damaged tripods. By the 1938 radio play, we are explicitly told that the Martians lose only one machine. By the 1953 film, the war machines are totally indestructible, and even an atomic bomb fails to put so much as a scratch on them. Arguably this is an unavoidable part of technology lag - the main problem the humans had in the book was hitting the fast-moving Martian machines directly with conventional artillery (as well as a lack of defense against chemical weapons), and modern weapons are both more powerful and more accurate. If later adaptions didn't "cheat" on behalf of the Martians by making them Immune to Bullets, the Curb Stomp Battle would be in the other direction. To Serve Man: The Martians feed on people by draining them of blood. Tripod Terror: The Trope Maker. We Come in Peace, Shoot to Kill: When a group of people (including three named characters) approaches the Martians to communicate, the aliens make their intentions quickly and brutally clear. We Hardly Knew Ye: Both Henderson and Stent. Neither one receives much Character Development or has much bearing on the plot, and they die too quickly for anyone to get too attached to them. Xanatos Speed Chess: The Martians initially underestimate the humans, but as they suffer setbacks they show off their superior intelligence by adapting to each unforeseen threat after it occurs - after artillery takes down one of their walkers, the Martians use dispersed formations and deploy the Black Smoke. After the Thunder Child, they start fooling around with flying machines. Zeerust: One particular illustration of the tripods drawn by Warwick Goble makes them look atrociously mechanical and clunky, more like walking water towers than anything else. Incidentally, Wells hated this picture so much that he included a Take That against it in a later chapter. Other contemporary illustrations have actually stood the test of time much better. This page was last edited on 22 May 2018, at 13:41.